The curtain rises on a comic book scene, narrated by dramatic reporter Max Volume. It's midnight at City Hall and the Mayor of Megaville is held captive by Super-Villain, The Bogeyman! The terrified citizens and Mayor are relieved when, with a flourishing fanfare, Superstan flies to their rescue and defeats the Bogeyman with witty banter and a stylised musical battle. The Mayor and citizens thank Superstan and chant his name in celebration as the scene dissolves into morning in Megaville's Proton Park, where sweet seller Stanley Marvel stands dreamily in Superstan's pose. As the chants become a voice calling Stanley's name in an attempt to wake him, we realise that we have just witnessed another of Stan's superhero daydreams. Stan's best friend DC wakes him from his slumber and berates him for his Superhero obsession and constant daydreaming, explaining that he is missing out on the real adventure - life - and introduces the fun opening number "Live A Little". Stan's hysterically eccentric Gran, Ruby Marvel, enters and comically embarrasses her grandson by attempting to keep him warm and well fed, then introduces her friends, the crazy Crumblies. They inform Stan he needs more drive and ambition, but it also becomes clear that Stan has a peculiar problem with clumsiness. A sudden commotion erupts as the whole city gathers for a special event organised by Mayor Doughnut, who arrives to announce Megaville's "Hero Of The Year" award. The recipient is local sweet maker The Candy King who, we realise, has won the accolade through bribery. He offers free gobstoppers to the citizens and a cream cake to the Mayor, to be presented by clumsy Stanley Marvel. Stanley cautiously carries the cake, recalling in the flashback song "Staggering Stanley" how his clumsiness ruined his other jobs.. Through the song he brings the Marines to their knees, destroys a priceless vase and, returning to the present day, throws the cream cake at the Mayor to find himself fired on the final beat! Our broadcasting narrators Max Volume and Sunny Day take us to the Fun Factory, The Candy King's confectionery business, where we meet his three mad scientists and discover the terrifying truth behind The Candy King. He is a Super-Villain planning to conquer the world with his evil sweets. Curly and Wurly, two dim-witted new recruits from the rent-a-villain agency, arrive in the evil elevator to join The Candy King's team and we meet the minions, the factory's team of workers and minininjas. The Candy King proudly reviews his past evil achievements and explains that his seemingly kind free gift to the people of Megaville were actually hypnotic gobstoppers, allowing him to command every citizen with his giant remote control! Max and Sunny return us to Proton Park, where DC attempts to cheer up an unemployed Stan with the song "Every Step Of The Way (Pre-Reprise)". They are interrupted by Gran and her Crumblies who bring worrying news of strange events in the city. They hide and watch as Curly and Wurly enter with the giant remote control and test it on passing citizens with hilarious results. As they leave to make more mischief, Stan, DC and the Crumblies discuss the revelations, but Gran has some revelations of her own. She and her elderly chums explain their mysterious past as secret scientists who developed Formula Forty-Four which gave them super powers. They had become Superheroes back in their prime and defeated the villains of the day, but lost Stan's grandfather in the process. Gran then reveals that she had accidentally given him a half-dose of formula when he was a baby, explaining his hidden strength and clumsiness. Knowing this is Megaville's only chance, she gives Stan the second half-dose and in a comical transformation Stanley Marvel becomes Superstan! Gran explains that although he has many powers, he cannot fly without the aid of "the most powerful object in the universe" and dramatically presents him with a pair of fantastic elastic Anti-Gravity Pants. Stan puts them on and the chorus enter to sing the fun-filled number, "Anti-Gravity Pants". At the offices of the Daily Globe, editor Dan Deadline scalds his risible reporters for failing to find news, so they are delighted when they receive a text about the strange events happening across the city. We jump to City Hall, where a fuming Mayor Doughnut is chastising General Commotion and his Marines for allowing the morning's cream cake chaos. Things turn from bad to worse when the Mayor receives a text about the mayhem in Megaville. Pestered by the press, he addresses the Megaville citizens, telling them of the secret Superheroes that had defended the city in the past and showing them the Big Red Button that called them to action. With one press, Superstan arrives to save the day and all sing the exciting song "Superstan". Back at The Fun Factory, The Candy King is having staffing problems with the Minions, which he solves by shrinking one of them with his Candy Cane shrink ray. The villains don't believe Curly and Wurly when they return with news of the city's new Superhero, but when the Toffee Apple Computer is eventually fired up and emits a Superhero alert, they discover the truth and The Candy King decides to control the citizens to kidnap the Mayor and prepare a trap for Superstan. Max and Sunny return us to Proton Park, where Superstan is undergoing intensive and comical training from his mentors, the Crumblies. However, when the time comes to go into battle for real, Stan is suddenly unsure of his new abilities and Gran and DC assure him they will help, as Gran and the chorus sing the uplifting song "Every Step Of The Way". We return for the final time to the Fun Factory at midnight, where the hypnotised citizens hold Mayor Doughnut captive. When he refuses to concede defeat, The Candy King commands the citizens to take their prisoner to the dungeon, then goes to prepare for Superstan, leaving Curly and Wurly alone on lookout duty with the remote control. When Superstan arrives, they throw the remote at him and try to escape to the secret basement using the evil elevator, but speedy Superstan beats them to it and uses the remote to control them and discover The Candy King's plans. The Marines arrest the villainous duo alongside the mad scientists, leaving Superstan to face the minions in a comical musical battle with a hilarious final twist. DC, Gran and the Crumblies arrive to give Stan his Utensil Belt with many useful kitchen utensils, and Gran warns him of the possibility of the formula effects wearing off. The gang race off to hunt baddies and rescue prisoners, we see the press searching for headlines and finally Superstan is alone and about to face The Candy King. Suddenly, just as Gran had warned, the formula fails, his powers fade and he transforms back into mortal Stanley Marvel at just the wrong moment. But Stan, knowing the city relies on him, decides to make a stand anyway and sings the dramatic solo "Behind The Mask". The Candy King confronts Stanley who bravely stands up to the villain, but Gran comes to the rescue just in time with an emergency booster shot of Formula Forty-Four. Another comical transformation sees Superstan return to the delight of the now freed prisoners and citizens. The Candy King makes a startling revelation of his own, but when Stan refuses to join him on the dark side, the villain attempts to shrink Stan with his Candy Cane. A clever idea from DC turns the tables and it is The Candy King who is brought down to size. 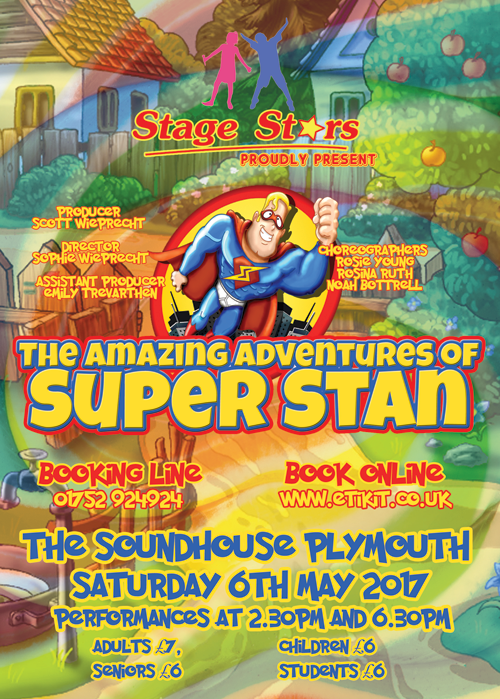 In the joyous relief and celebration, Superstan's identity is revealed to everyone's amazement, and all sing the rousing finale "Staggering Reprise". A show-stopping reprise of"Superstan" brings the show to a thrilling conclusion.